Turmeric (Curcuma longa) is an Indian spice with a long history of use in Ayurvedic medicine. Although the plant’s active constituents have been linked to an array of therapeutic properties, bioavailability can be a factor. This Whitepaper by Aurea Biolabs explores the company’s patented polar-non polar sandwiching (PNS) technology, designed to re-create the natural matrix of turmeric, thereby increasing the bioavailability of curcuminoids. • Phytochemical analysis of turmeric found more than 200 molecules with attributable health benefits. • The antioxidant activity of curcuminoids plays a key role in turmeric’s anti-inflammatory support. 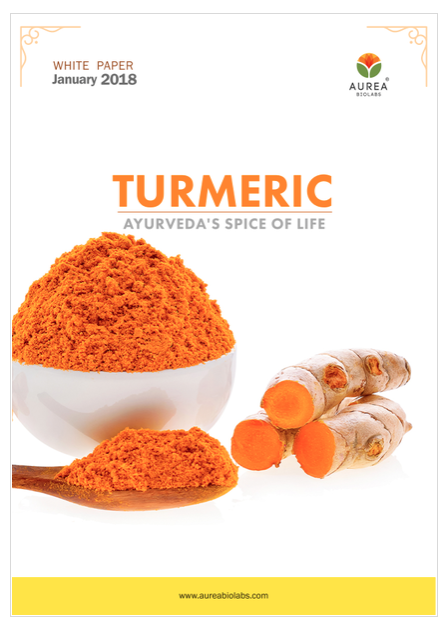 • Aurea’s turmeric formulation is branded as Cureit and sold in the United States as ACUMIN.